If you know someone who’s played the game for many years (say 5 or more)- take a look in their bag. You might find a Champion Cobra. You might find a Champion Gator, or a first run Z-Buzzz. You might even find some “CE” Teebirds. All these vintage discs are notoriously flat-topped, as their flight plate has no dome to speak of. But if you go to a disc golf shop, and try to buy the newer versions of these discs- you’ll could end up with a big ol’ pop top. I have no proof for which flies better, or which is more stable- those are discussions for another day, and there are tons of threads dedicated to those topics. The important thing is this: The discs Innova is putting out there today have domes (as well as a few Discraft molds). They might be better or worse in a lot of ways, but my basic first reaction is: WTF? I don’t like domes. There are some discs that have domes naturally- and you know this from the get-go: Latitude 64 makes a disc called the “Flow,” and the premise of the disc is to have a dome, and to glide a long way. There are even vintage discs like the “86 Softie” which practically look like a Yamaka. I’m mostly trying to address discs like the Gator, Teebird, Cobra and Leopard- which have been around quite a few years, and in the past have been available- but they were essentially different shapes back then. The modification process is very simple- lay your disc in a cookie sheet, fill it with boiling water, put another flat pan on top with a stack of books on top. The weight and the heat will coax the plastic into a new shape: FLAT. It tends to work better on DX, but does work (to a lesser extent) on premium plastics like Champ and Star if done multiple times. The problem is most people believe this to be a “post-production modification of a disc which alters it’s original flight characteristics…” You could argue that you’re not modifying the flight characteristics, but there is no way to prove that. The principle is very obvious- the PDGA approved the manufacturing of a disc to specific measurements, and if you were to modify it (for example cut a big hole in it, it won’t go as far)- you’re throwing something that the PDGA hasn’t looked at or approved. The other icing on the cake for the PDGA rules, is that even just by “carrying” a modified disc, you’re subject to immediate penalty strokes without a warning. So anyone who participates in this type of “flat-topping” has to decide if they care or not. I see the debate much like I see the mp3 file sharing debate. The rules are clear cut, and everybody more or less knows what is right and wrong. However, in the end, a whole lot of people, including myself, choose to bend the rules. For example I bought a Factory Second Star Gator. The thing was all warped and had a ridiculous pop-top dome. I figured I’d throw it anyway, as I needed another reliable Gator for wooded courses. 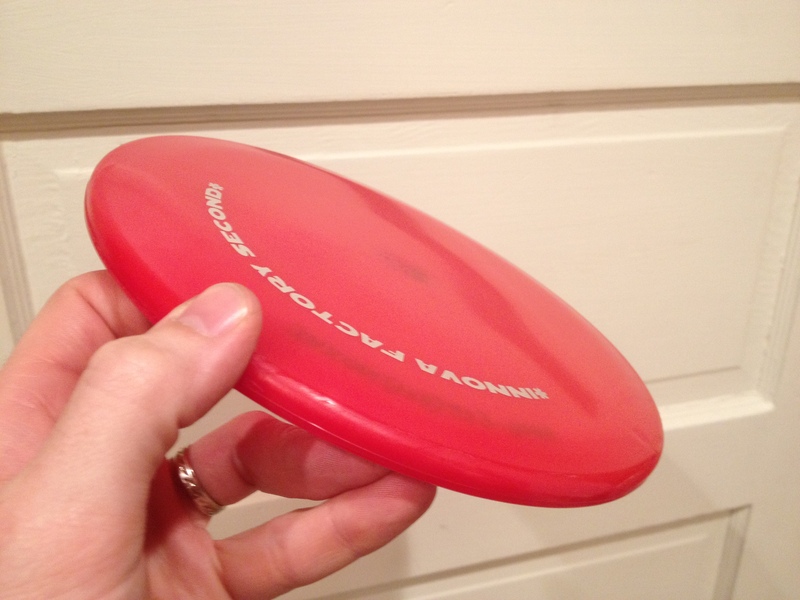 But after about six months the disc never entered my bag: it was too ugly. So I tried the boiling water technique on it- and boom. That sucker is flat now. It doesn’t have the exact same flat flight plate as an original Champion Gator, because the rim leading up to the flight plate is too big. You can’t “shrink” the flight plate and thus pull the rim inward- you can only flatten the top. If you compared my Factory Second Star Gator to a vintage Champion Gator, the difference would be obvious. Will I ever use this disc in a tournament? Honestly, no. It was an experiment- and unfortunately for me it worked perfectly. Now all I want to do is throw that thing! But I would feel like an idiot if I used it, and someone called me on it. I’m not one to lie (I’m terrible at it! ), so I’d probably fess up, and have egg on my face. I will however, use it in casual rounds. These are the same rounds where my friends pick up my disc off the ground when it’s within five feet of the bucket. We also wear ripped clothing, loudly swear, and walk into each other’s line of sight- all of which are against PDGA rules. But we’re friends, and we don’t care. The thing that I keep coming back to has two parts. Part one is: the quality of discs seems different, and thus warrants our attention as players. We should be able to make these 2012 discs conform to the shape of the 2002 (or earlier) molds which were originally scrutinized by the PDGA. The second part is: What exactly is altering the flight characteristics? They go out of their way to allow “light sanding” which is reasonable. However, what if I were to buy 20 brand new Innova Teebirds (all of which will probably be domey), stuff them into a super-small disc golf bag, put them under a pile of other discs and store them next to the heater in my house for a year? They’d probably flatten out quite a bit. They’d also flatten out if I put them in the trunk of my car under my toolbox all summer. I don’t consider either of these scenarios to be out of the PDGA guidelines, and I would never support the use of the disc modification rule on these hypothetical situations. 802.01 C- Players may not make post-production modification of discs which alter their original flight characteristics. This rule does not forbid inevitable wear and tear from usage during play or the moderate sanding of discs to smooth molding imperfections or scrape marks. Discs excessively sanded or painted with a material of detectable thickness are illegal. See sections 802.01 D, E and F.
802.01 E- A player who carries an illegal disc during play shall receive two penalty throws, without a warning, if observed by two or more players of the group or an official. A player who repeatedly throws an illegal disc during the round may be subject to disqualification in accordance with Section 3.3 of the PDGA Competition Manual. This entry was posted in Equipment and Gear and tagged disc, dome, flat, golf, innova, modification, quality, seasoning, speed, top. Bookmark the permalink.